I’m a baseball fan, and a Chicago Cubs fan. I’ve been a fan since I was in first grade. I explained my feelings about the Cubs in my (very-first) silent scream. Though I’m a Cubs fan, I’ve lived in Minnesota for more than twenty years. The local Minnesota Twins have grown on me. 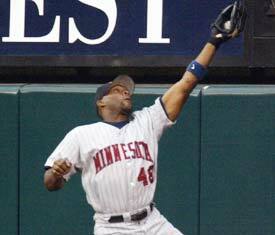 My favorite Twins have been Jim Thome and Torii Hunter. Yesterday I read an inspirational essay entitled, “Torii Hunter is a Father First, Ballplayer Second” by Steve Kornacki. Against the odds it’s an inspirational story explaining how Hunter chose to follow biblical principles and a wise mentor as he sought to make the best of his youthful mistakes. AMEN Todd, Amen! Thanks for reading and commenting. I’ll bookmark your weblog and check again here regularly. I am quite sure I’ll learn plenty of new stuff right here!